The last experiment I want to talk about this week is our summer mulch experiment. You'll remember that I've been testing out lots of different mulches this spring, including grass clippings, autumn leaves, newspaper, and cardboard. How are they doing a month later? When I laid down the mulches, I was hoping I could put them directly on top of small weeds rather than taking the time to weed each bed before I mulched it. Newspaper and cardboard did an admirable job of smothering the weeds, but the naughty plants grew right through the grass clippings and autumn leaves. In the case of the former, I couldn't even tell that the bed had been mulched a month later and just weeded as usual, but it was quite difficult to pull weeds from the autumn leaf mulched beds without taking half the mulch away with them. I was a bit concerned that mulches with a high C:N ratio would retard the growth of my plants by locking up nitrogen in the soil, and three of our pea beds do seem to have some problems. 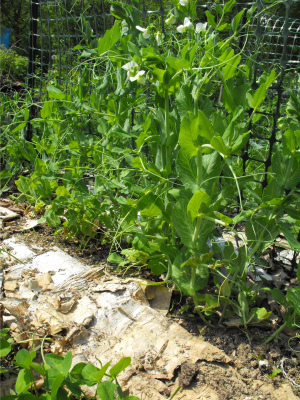 Rather than growing lush and green, the peas are yellowing at the base and barely growing. 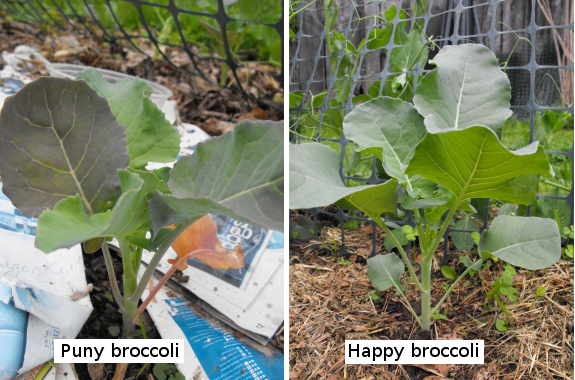 Interspersed broccoli is huge and luxuriant in some beds, but puny and purple-tinged in others. But is there a correlation between mulch and plant health? I can't be sure. All three of the sad-looking beds were mulched with a combination of paper with colored ink and autumn leaves, but some similarly mulched beds are fine. My best guess is that the puny plants are reacting to something in glossy paper, but I didn't keep records of which beds got glossy and which didn't, and the paper has decomposed enough that gloss is no longer visible. It's also quite possible that some non-mulch-related variable is at work, but I'll play it safe and keep glossy paper away from my plants in the future. Although the grass clippings didn't do much for weed control on already weedy beds, they did keep weed-free beds from growing new weeds. In addition, the grass clippings seemed to work as a light fertilizer, resulting in plants that were big and healthy. If I have time to weed first (and enough grass clippings to go around), grass mulch seems to be a winner. I only mulched one bed with cardboard, but this mulch seems to be a winner as well --- cardboard is a great weed retardant, has no ill effects on plants, and doesn't blow around the way paper did for the first few days before it melded to the soil. I'm not surprised since I learned in Steve Solomon's book that corrugated cardboard has a C:N ratio comparable to straw rather than to paper due to the nitrogen in the glue. I'm mulching several more beds with cardboard this week and will give you an update in a month or two on positives and negatives. Fund your journey back to the land. I'm using a combination of newspaper and hay in my garden this year. 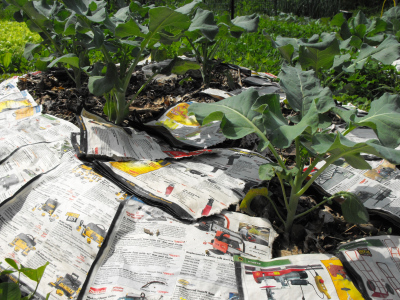 I don't use glossy paper, I had known already that it was not good for mulch. The hay concerns me a little, as to the seeds in it, but I'm hoping that the thickness of the mulch will do the job anyhow. I've used grass clipping before, however those were in my blueberries. The biggest problem I had with that was the surface dried and became slightly water repellent. It did not help my blueberries, but then again, NOTHING helped them. I lost all 40 bushes though I tried everything in the book to save them. I think the soil is not the best for them in that location. Great info on this post!~ Thanks! I supposedly knew glossy paper was bad, but it's awfully hard for me to throw anything away and that glossy paper needed a home. Next time, I'll really know better. I've noticed when using weedy mulch or compost that all's well as long as the mulch stays in place. It's only if you have to rake back the mulch to let a small seed germinate that you get into trouble. As long as you use transplants in the hay mulch area, you should be fine! Some people let it compost for a year to kill the seeds, I think. Forty bushes lost! That breaks my heart! Our dozen are doing well now that I bit the bullet and bought the chemical acidifier. Our soil is just too alkaline for them otherwise. You might try the grass clippings on your vegetable garden, spreading it no thicker than two inches or so. At that thickness, it'll melt in and shouldn't repel any water.